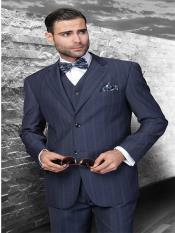 Mensusa https://www.mensusa.com/articles/mens-blue-pinstripe-suit-a-classy-favorite.html Mens Blue Pinstripe Suit- A Classy Favorite Mens blue pinstripe suit, with its fine elegance raise the allure of the suit by several notches when draped around a man who knows his worth. The parallel lines that run the length of these fine ensembles make anyone look like a billion bucks. Mens blue pinstripe suit cannot go wrong in any circumstances. There's nothing that can dress a man more that the classic sets, and blue pinstripe suits are not far behind. Neat, impeccable, flattering and easy on the eyes, mens blue pinstripe suit have always been a well-liked choice of clothing. The stripes may be bold or subtle but they have the same suave effect. Generally speaking, pinstripe suits have been typically associated with upscale businessmen or professions that have to do with the finance sector. This is what gives such an appeal to the pinstripe suit- it is a mark of achievement that signifies you have worked hard and climbed up the tough stairs to the place you stand at today. No matter how far you have come along your career, owning a pinstripe suit certainly adds to your persona and people will respect you for having earned what you rightfully deserve. The usual rule of thumb is pinstripe suits are not flashy and do not draw attention to themselves. They are somber yet not depressing, quiet but not suppressed either. Deeper and darker shades work better on pinstripe suits, with the occasional light hue in between. When we come to a blue pinstripe suit, there are good and feasible fashion possibilities. On a navy suit, you can top it with a cream tie or a subtle charcoal one. Add shiny dress shoes- a fitting choice would be Oxfords- and a pocket square that matches your tie, and you are done! With more fabrics and cuts to choose from these days, you won't have to spend a long time deciding on one that fits your physique and comfort. Online shopping sites offer a plethora of stores you can choose from, or if you like, you can also opt for the conventional manner of shopping at your family shopping centers. There are advantages to both approaches. On online platforms, you can easily choose the style, cut and hit a button to get your dream suit. In traditional stores, you get to feel the fabric and try it on before you make the purchase, and if need be ask for necessary alterations. Mens blue pinstripe suit make for an essential staple in any man's adult wardrobe. While it is often associated with the banking sector, it is not strictly limited to it. Blue pinstripe shirts are a mark of attainment, a feat not accomplished nor displayed early in any career- hence once you have earned your own blue pinstripe suit, know that you have opened the way to kudos and praises and admiration coming your way! A well-dressed man can take on any battle the world brings him to. There's no reason to not strive to become one!